March 27, 2019 (Peoria, IL) – As the seasons transition from winter to spring, the Community Development Department would like to encourage residents to develop a maintenance plan for yard work and commonly seen property maintenance issues. • Garbage must be placed in a container with a tight-fitting lid, and garbage cans must be returned from the alley within 24 hours of pickup. Loose trash and litter cause blight and contribute to rat issues. • Grass and weeds cannot exceed ten inches in length. This includes growth in fence lines, around foundations, and at the alley. If there is a privacy fence on the property, the alley side of the fence must be maintained. Tall grass decreases property values and can lead to mosquito issues. • Limbs, branches, and debris must be removed from the property. Maintenance plans should address branches that fall off during a storm to ensure they are removed in a timely manner. • Litter must be removed from the entire property, including the alley, around porches, curb lines, and fence lines. Residents are encouraged to support the neighborhood by picking up litter. • Vehicles cannot be parked on an unpaved surface. This includes the front yard, back yard, side yard, and along the alley. If you have questions on how to add additional parking to your property, please contact the Community Development Department’s Development Center at 309.494-8600. • Vehicles parked on the property must be licensed and operable, tags must be current, and the vehicle cannot be in disrepair. Inoperable vehicles are an eyesore and cause blight in neighborhoods. 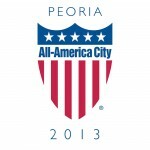 The city of Peoria thanks citizens for their commitment to keeping Peoria clean and safe. The Community Development Department works to reduce blight in neighborhoods, protect property values, increase public safety, and encourage neighborhood development. If you notice properties not being maintained in your neighborhood, please submit a complaint through the City of Peoria website or the Peoria Cares Application that is available for iPhones and Androids. You can also call 309-494-CARE. Property maintenance is a simple way to appreciate our neighborhoods and give us all more reasons to appreciate Peoria. For more information related to property maintenance, visit.AppreciatePeoria.com or PeoriaCodeViolations.com.